This week was a whole lot better – Elder Mason and I are both starting to get more into the work because everything is looking really positive right now. Elder Mason and I are good about having inventories whenever we need to and so by doing that we are able to figure out what is wrong and we always usually come up with solutions to help out with whatever it is that we are going through. We did that this past week when at the time we both were not feeling it at all as far as going out and working, and so we were able to talk it out and figure out a new thing that we could both start doing in order to get more excited about the work. We both summed it up that if we go out and work then the time will move faster, and that working is the only way to create memories and to have weird experiences. That was the case this past week because we found someone that we put on date for February 14th (we intentionally put her on date for that day because it would be awesome to see that happen on that day). We also have some other potentials that we will be able to pick up this week, so things are definitely looking a lot more positive now that things are moving more. 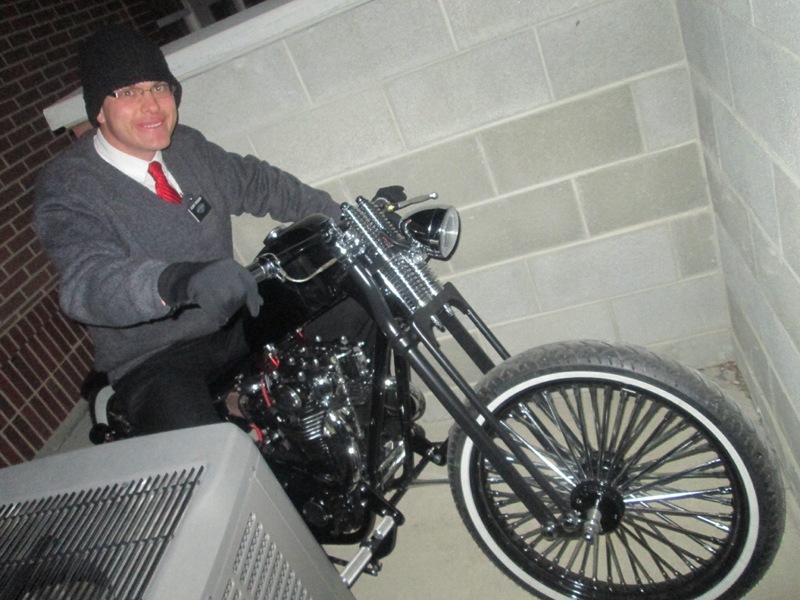 We also had some random experiences too: one night we were just going to the stake center at the end of the night to use the restroom, but this one guy was walking his motorcycle to the building because it broke down. He asked us as we were walking up to the building if we knew of a place where he could put his motorcycle so that he could come back the following day and get it. We told him that he could hide it behind the wall where the outdoor air vents are and so right before we left to go back home we moved the bike in a little bit more so that nobody would get any ideas and then we both got pictures of each of us sitting on this guy’s motorcycle (he was gone by that time). Then we had a family home evening lesson with a family in one of our wards and while we were having it their kid who is about our age and preparing for a mission was going on about how awesome it was to be able to meet Elder Jeffrey R. Holland at a stake conference that he went to. He expressed everything pretty well, but then said that he licked him (licked his hand before shaking his hand and then licked it again) so that was kind of odd, but really funny?! Then the father of the family looked at both of us and said to Elder Mason “I just look at you and I want to give you a hug” Then he told me that I looked too serious and then he looked back at Elder Mason and got up and gave him a hug so that was pretty funny. Everything is getting a whole lot better and Elder Mason and I are both enjoying it like crazy again now. We are both planning on being together for 5 transfers so we don’t need to worry about what will be happening when the 29th comes around. That is about it from here. It is good hearing from y’all and that is funny that you were trying to look for me, Andy. Maybe when you stay longer I can show you around ha ha ha. I love and miss all of y’all and I hope that y’all continue to do well!